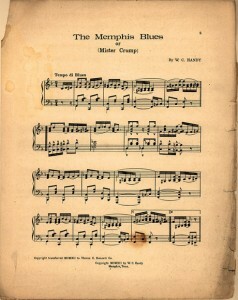 This entry was posted in Katie Berg and tagged blues, memphis, Memphis Blues, st. louis, st. louis blues, W.C. 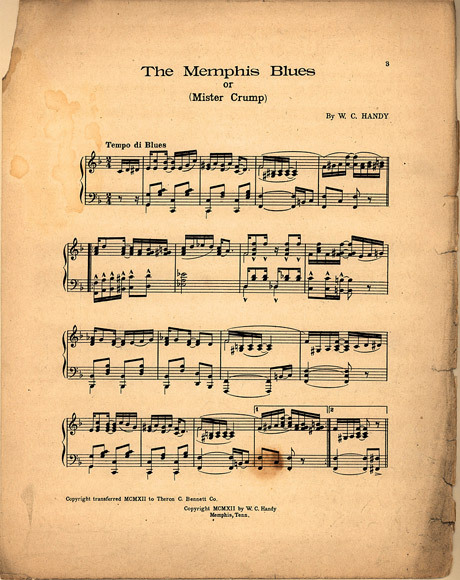 Handy, yellow dog blues by bergka. Bookmark the permalink. Great post, K! I’d love to know more about that photograph you found through the Library of Congress. When was it taken, by whom, and where? It seems like a primary source that can tell us something about how Handy was received late in his life, perhaps confirming what we already know, but also perhaps complicating what we think we know. Similarly, the documentary you found is great (I loved the footage of the stadium concert in honor of Handy) but it’d be good to know more about who produced it and what you think they’re trying to accomplish. 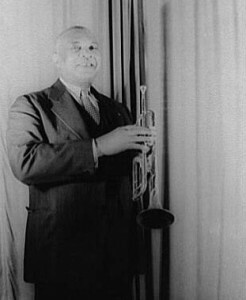 For instance, they use archival recordings of Handy’s voice to help tell his story – but as we know, Handy’s version of his “discovery” of the blues changed over time, and thus deserves critical pressure from historians, even if we still come to the conclusion that he played an important role in creating and popularizing the blues. I’m looking forward to seeing how you contextualize and criticize the primary sources you highlight in future posts!